Truck stops provide basic needs for drivers, but they often lack in areas that help drivers maintain a healthier lifestyle, according to research from the National Institute for Occupational Safety and Health (NIOSH). Researchers visited a sample of 16 truck stops in 10 states as part of the NIOSH national survey of long-haul truck driver injury and health. Using a checklist developed by the organization, researchers looked at the availability of exercise facilities, medical clinics, and restaurant and grocery store healthy food options available at truck stops and surrounding areas. The study defined facilities in the surrounding area as being visible from the truck stop and within safe walking distance or with tractor-trailer access. The study revealed that while most truck stops provide basics such as room to sleep, a meal, and use of the restroom, the sites surveyed did not score well for providing healthy options for food, or access to exercise and healthcare facilities. The report revealed that none of the truck stops offered facilities for exercise and 81 percent did not have a walking path. Nearly all the truck stops — 94 percent — lacked any access to healthcare facilities. Of the 16 truck stops surveyed, restaurant and convenience store menus at half the stops lacked any fresh fruit and a third lacked any fresh vegetables. 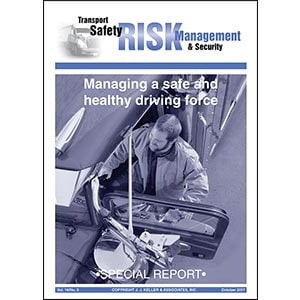 J. J. Keller's Special Report - Managing a Safe and Healthy Driving Force helps transport safety managers understand the symbiotic relationship between health and safety, and how important both of these areas are to managing transport teams.